I knew that for Fall Market I wanted to design a clutch. I had several ideas popping around in my head, but hadn’t settled on a specific style…that is…until I happened upon Moda Fabrics “Little Black Dress” by Basic Grey…H-E-L-L-O, it was love at first sight for me!!! This fabric collection encompasses my absolute favorite colors. The beautiful patterns and stunning classic hues ranging from pure milky ivories and warm nickel greys to rich ink blacks…they are simply gorgeous…PERIOD! 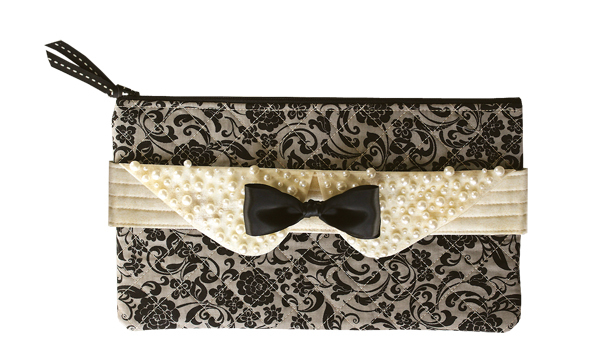 I have been a fan of the original “little black dress” designer, Gabrielle “Coco” Chanel, for years and I immediately thought of her when I saw this collection and the “Town Clutch” design was born! My taste being eclectic, I enjoy the juxtaposition of almost everything, so I thought about what would contrast nicely with a glamorous night on the town, and then decided that “Town & Country” would be the perfect title for my new pattern. I was so excited by the prospect of tying-together my classic pattern design and Coco’s influence of simple, functional elegance to capture the sophistication of the “Town”. 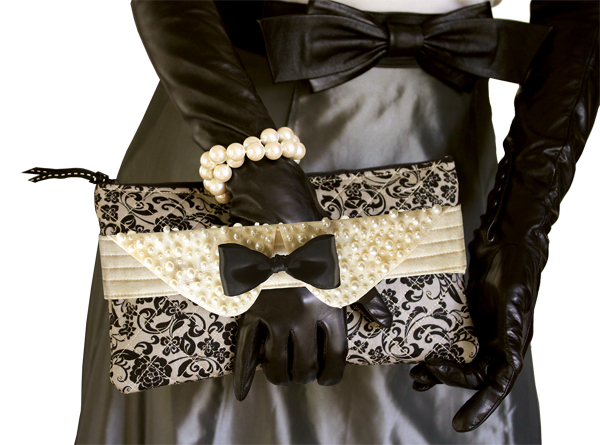 Slip your hand under the unique hand strap to keep the clutch secure and close. The collar can be left plain, or easily embellished with pearls, beads, sequins and accented with a bow tie or a button. The interior divided pocket helps to keep things nicely organized. For the “Country” element, my inspiration came partly from the 2012 Olympic equestrian events of this past summer and my love of the simple silhouettes that became popular during the mid-nineteenth century. 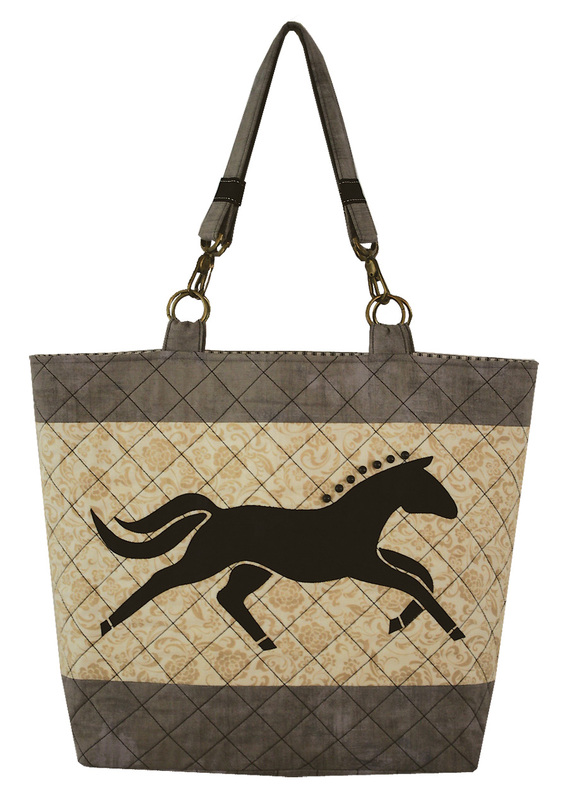 I chose to design a functional roomy tote so that it could feature a large silhouette of a thoroughbred horse with a button-braided mane on a quilted background. This striking feature is so easy and fun to achieve by using the fusible applique technique and adding small round buttons for the button-braided mane. Easy-to find hardware adds a clever harness-look detail. 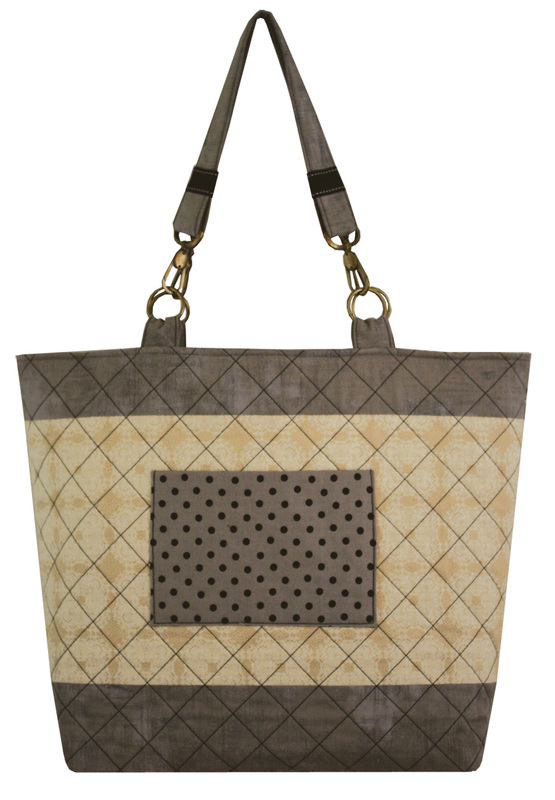 The back of the tote features a convenient exterior pocket and 2 extra-large interior pockets keep things organized. So whether it’s a night on the town or a day in the country, these pretty pieces are sure to keep you in high style! 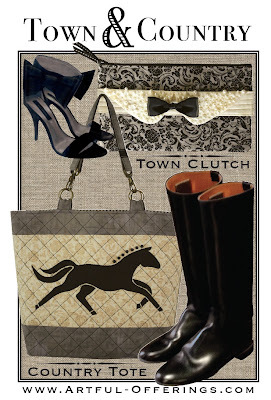 I hope you enjoy making the town clutch and the country tote as much as I enjoyed creating them. What is your one guilty pleasure in life? 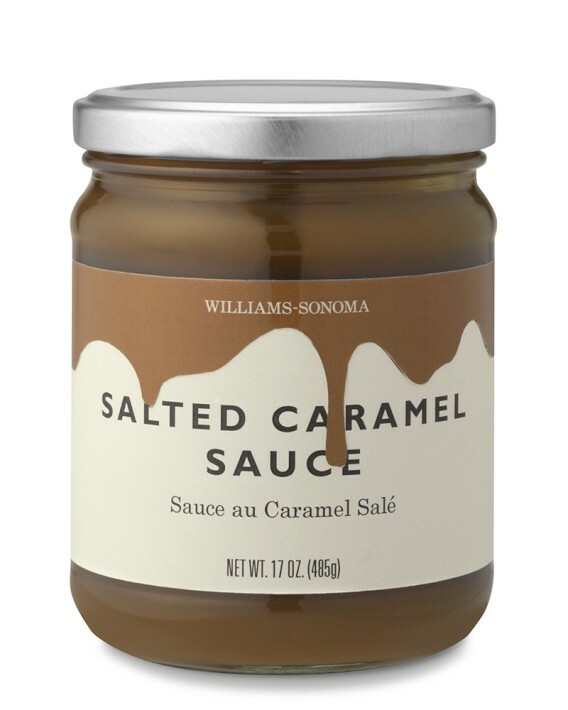 Hmmm…I would definitely have to say the Salted Caramel Sauce by Williams-Sonoma. I could eat this rich and creamy sauce by the spoonful! It is wicked delicious when heated up and generously drizzled on french vanilla ice cream from Sullivan Farms (our local dairy creamery shop) and topped with fresh blueberries or heavily dolloped on a piece of plain New York style cheese cake with or without fresh berries…hold me back! Where do you do your best thinking? While I am constantly inspired by my surroundings in what ever I do, it never fails that I seem to come up with some of my favorite ideas when I am in the shower or late at night in bed when I am trying to get to sleep. What do you listen to when you work? I LOVE music, so I have an extensive iTunes collection, which I play on my Apple Macintosh computer through external stereo speakers and a subwoofer. The music I play depends on the mood I’m in or what project I’m working on and whether or not I need to keep a good pace to get things finished or a slower pace that is perfect for times when meticulous sewing needs to be done. Whether I have the tunes cranked up until the windows are bulging to the beat or turned down low and in the background, music is a big part of my life here in my studio. I am a fan of Country, R&B, Classical, Pop, Rock, New Wave, Alternative, Electronica and of course Christmas music during the holidays. Right now, I’m listening to the oh-so-talented Michelle Branch! Many thanks to Moda United Notions for inviting me to blog here on The Cutting Table and getting a chance to share my newest design with your loyal and enthusiastic bloggers. It’s been quite enjoyable! Our Town & Country pattern (Artful Offerings Pattern No. 2012141) along with the model/samples will be featured at the Fall Quilt Market trade show for wholesalers in the Moda United Notions Booth (October 27-29, 2012). Wholesalers, please order through United Notions and retail customers please order through our website at www.ArtfulOfferings.com. Happy stitching! Next Next post: Mary Jane Butters: Glamping!